Our decorations are up, the kids’ costumes are ordered, and earlier this week, right on cue, a streak of stormy weather moved in. All in all, the perfect time for getting out our Halloween-themed books and sharing tales of ghosts and goblins with my revved up trick-or-treaters (it’s not just about the sugar, my sugars). Honestly, I’ve been a bit underwhelmed by this year’s Halloween offerings. Of course, last year was particularly exceptional: we were treated to Creepy Carrots, The Monsters’ Monster, and Vampirina Ballerina—all three brilliant and all three enjoyed (since none actually mention Halloween) long past pumpkin-carving season. But speaking of pumpkins, it has been a long time since a great pumpkin book has entered the scene, and this year of slim pickings has at least given us that. Stephen Savage’s Ten Orange Pumpkins (Ages 2-6) is billed as a counting book—and it’s true that there are opportunities to count on every page, as ten pumpkins become nine, become eight, and so on. 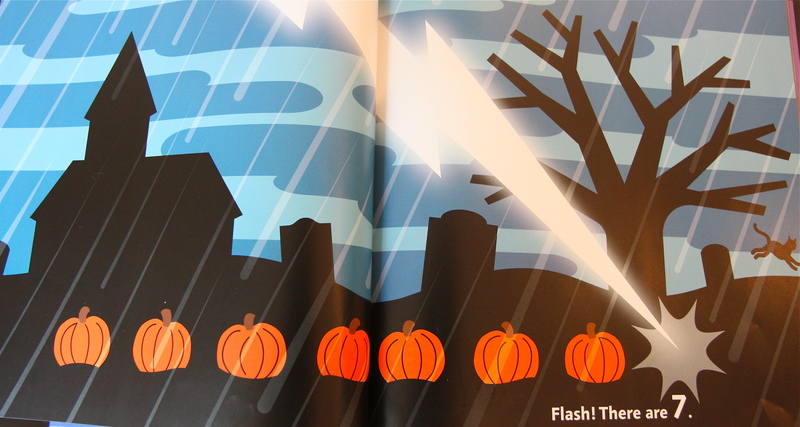 But the “trick” of the book lies in how each pumpkin disappears, and the answers are (often quite subtly) revealed in the striking illustrations. In the opening spread, for instance, ten pumpkins sit beside a pair of pants, socks, and a shirt, all silhouetted in black on a clothesline: “Ten orange pumpkins,/ fresh off the vine./ Tonight will be a spooky night.” We turn the page to reveal the rhyme—“Yikes! There are 9”—with the nine pumpkins now beside an empty clothesline and a scarecrow with a carved pumpkin for a head. (For the record, it took my kids a good 60 seconds to figure out where the 10th pumpkin had gone.) A different fate befalls each of the other pumpkins: one becomes pie in the hands of a ghost; another falls off a truck into a pit of alligators; while still another is struck down by lightning on a rainy night much like tonight. The last pumpkin standing becomes the glowing jack-o-lantern of Halloween night. Savage’s artistic style has a distinct “flatness,” devised from digital art that emphasizes simple, two-dimensional forms with little to no detail. It is his magnificent use of color that infuses emotion into the pictures (his first book, Polar Bear Night, fills our hearts with warmth despite its ice-blue landscape). Any good Halloween book should make creative use of orange and black, and Savage does not disappoint. The deep vivid orange of the pumpkins shimmers on the page, so striking is its contrast to the largely monochromatic backgrounds, dominated by black silhouettes. Savage could easily have limited his palette to orange and black, but he doesn’t. Instead, he chooses a different color for each background—and each one feels spookier than the next, from the electrified green of the witch’s lair, to the crimson of the alligator water, to the smoky grey of the pirate ship descending through the fog. Night after night this week, as the rain has pummeled the window panes, I’ve cuddled my little ones under a blanket on the couch and read this simple but perfect book—counting the pumpkins as we count down to our own All Hallow’s Eve. « Bang! Crash! Interstellar Collisions! You are currently reading Counting Down to Halloween at What to Read to Your Kids.